The following bulletin was obtained from the public website of an organization for retired law enforcement. 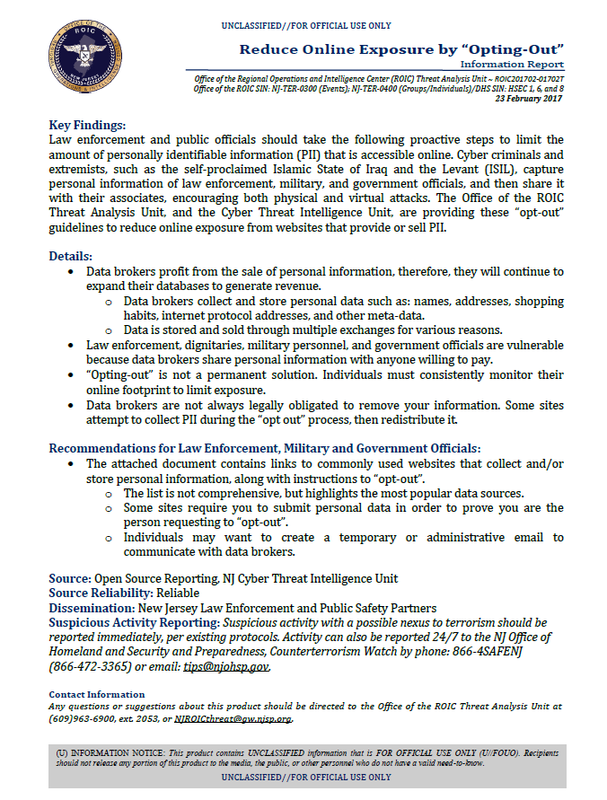 Law enforcement and public officials should take the following proactive steps to limit the amount of personally identifiable information (PII) that is accessible online. Cyber criminals and extremists, such as the self-proclaimed Islamic State of Iraq and the Levant (ISIL), capture personal information of law enforcement, military, and government officials, and then share it with their associates, encouraging both physical and virtual attacks. 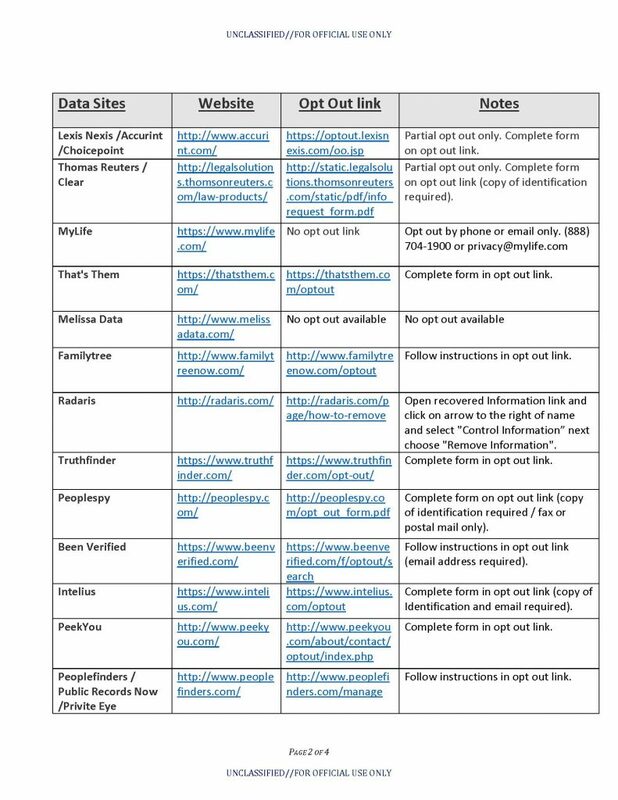 The Office of the ROIC Threat Analysis Unit, and the Cyber Threat Intelligence Unit, are providing these “opt-out” guidelines to reduce online exposure from websites that provide or sell PII. Data brokers profit from the sale of personal information, therefore, they will continue to expand their databases to generate revenue. Data brokers collect and store personal data such as: names, addresses, shopping habits, internet protocol addresses, and other meta-data. Data is stored and sold through multiple exchanges for various reasons. Law enforcement, dignitaries, military personnel, and government officials are vulnerable because data brokers share personal information with anyone willing to pay. “Opting-out” is not a permanent solution. 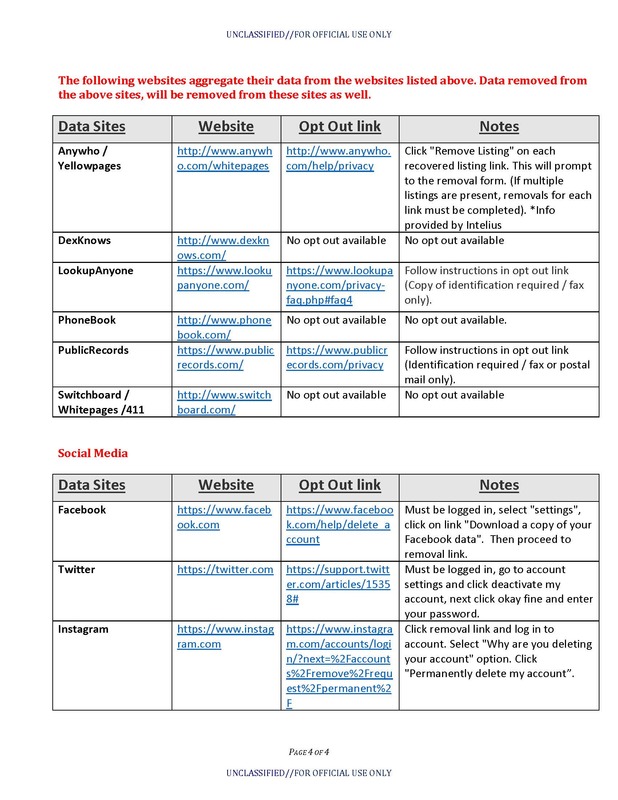 Individuals must consistently monitor their online footprint to limit exposure. Data brokers are not always legally obligated to remove your information. 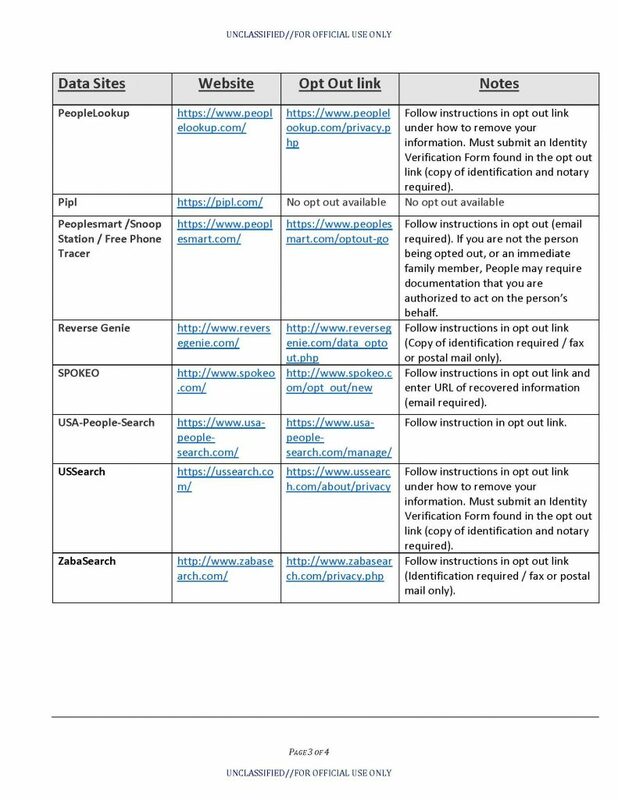 Some sites attempt to collect PII during the “opt out” process, then redistribute it. The attached document contains links to commonly used websites that collect and/or store personal information, along with instructions to “opt-out”. The list is not comprehensive, but highlights the most popular data sources. Some sites require you to submit personal data in order to prove you are the person requesting to “opt-out”. Individuals may want to create a temporary or administrative email to communicate with data brokers.